David Selznick bought the rights to The Prisoner of Zenda specifically as a starring vehicle for Ronald Colman, who was at the height of his fame coming off Lost Horizon (1937). Colman, of course, was cast in the dual role of Rudolf Rassendyl / King Rudolf, and Selznick surrounded him with a first-rate cast, including the glowing Madeleine Carroll as Princess Flavia, and C. Aubrey Smith and his whiskers as the king’s loyal Colonel Zapt. But best of all are the villains: Raymond Massey, looming and ominous as the would-be usurper Black Michael, and Douglas Fairbanks, Jr., as the raffish rogue Rupert of Hentzau, who steals every scene he appears in (as Rupert does in every version of Zenda). The story sticks pretty closely to that of Anthony Hope’s 1894 novel—and if you’re not familiar with it, why are you wasting time reading this? On the eve of his coronation, King Rudolf of Ruritania is kidnapped, but his loyal aides convince his lookalike English cousin to stand in for him. While impersonating his royal cousin, Rassendyll falls in love with the king’s betrothed, Princess Flavia—and she with him. Heartbreak ahead! 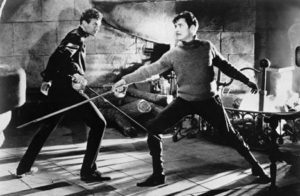 Meanwhile, good guys Colonel Zapt and Fritz von Tarlenheim (a very young David Niven) are in a desperate dance with the villains, as nice and nasty try to outmaneuver each other before their various threats and ultimatums erupt in violence. There’s so much to love in this movie: drugged wine, secret passages, throwing knives, and brooding Castle Zenda, so medievally murderous it’s practically a character unto itself. The outrageous helmets and embroidery-crusted uniforms of the Ruritanian nobles and guards cannot be improved upon. And everybody wears monocles! So fine.